Lotto Online • Bet on the Irish National Lottery • Buy online tickets here! No more queues, no more hassle, no more tickets - just convenience and instant wins. The Irish Lotto costs just €2 and you can take 2 more chances to win for just €1 extra. Draws are every Wednesday & Saturday and you can bet on the outcome and win all the same prizes at Lottoland. The main draw offers a minimum jackpot of at least €2 million, with €1m extra available on the Plus 1 draw and €250k on the Plus 2 draw. 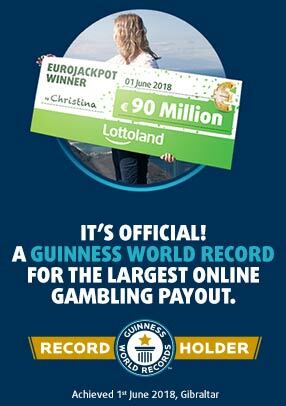 That means you can take the chance to win 3 jackpots for just €3! The Irish Lotto draws take place every Wednesday and Saturday night at roughly 8pm local time. Of course the Lotto draw never did make for riveting viewing, so get your results and instant win notifications though Lottoland instead! An Irish Favourite Since 1988! The odds of winning a prize on the Irish Lotto are just 1 in 29! On top of this the actual jackpot odds (just over 1 in ten million) are also very reasonable compared to most other lottos. And, for €1 more, you can enter the Plus 1 and Plus 2 draws boasting jackpots of €1m and €250k respectively! This is a real money gambling app/site. Please gamble responsibly and only bet what you can afford. For gambling addiction help and support, please contact Gamble Aware at 1800 753 753 or visit http://www.gambleaware.ie/.Lotto Online • Bet on the Irish National Lottery • Buy online tickets here!